To his supporters, General Wiranto is a national hero capable of returning the country to the prosperous days of the Suharto era. To his critics, he is a war criminal who should be behind bars rather than competing for the country's presidency as the candidate of the Golkar party. Gen Wiranto has been persistently dogged by allegations of human rights abuses in East Timor. Prosecutors say he is ultimately responsible for the killings of more than 1,000 people there when the former Indonesian province voted for independence from Indonesia in 1999. But against the odds, and despite the outrage of human rights groups, he won the race for the Golkar party's nomination for the 2004 presidential elections, edging out the party head Akbar Tanjung. Born the son of an impoverished teacher in Central Java, Wiranto graduated as a second lieutenant from the national military academy in 1968. Twenty years later, he became a key aide to Suharto, the former dictator who ruled Indonesia for more than 30 years with Golkar's backing. Wiranto became head of the military in the dying months of Suharto's regime, and has been credited with convincing the autocrat to give up power peacefully in May 1998, after days of political unrest. Wiranto maintained his position under Suharto's successor B J Habibie, but lost favour under the next president, Abdurrahman Wahid. Wahid effectively sacked Wiranto from his position as security minister in February 2000, amid allegations of human rights abuses in East Timor. He was accused of failing to stop his soldiers and pro-Jakarta militias from killing more than 1,000 people after the territory's vote to secede from Indonesian rule in 1999. In testimony to an Indonesian human rights tribunal, Wiranto denied the charges against him. 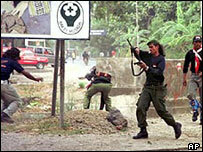 He blamed the violence on a long-standing internal conflict among opponents and supporters of East Timorese independence. "Indonesian security forces had an extraordinary difficult mission - I call it Mission Impossible," he said. But United Nations-sponsored prosecutors in East Timor disagreed, and indicted Wiranto for crimes against humanity. They are currently seeking an arrest warrant against him. Wiranto has a charm and charisma which may win voters to his side. He is renowned for his love of karaoke, and one of his first acts after leaving the armed forces was to record a CD of love songs to raise money for Indonesian refugees. As shown by his success in the Golkar Party nominations, he can also take advantage of the increasing nostalgia among many Indonesians for the Suharto era - when the economy was growing and the country was relatively secure. While analysts say he has a long way to go if he wants to beat Yudhoyono and Megawati to the presidency, they are nevertheless loathe to write him off. An old soldier never stops fighting, Wiranto is once quoted to have said - and it looks like he is staying true to his word.